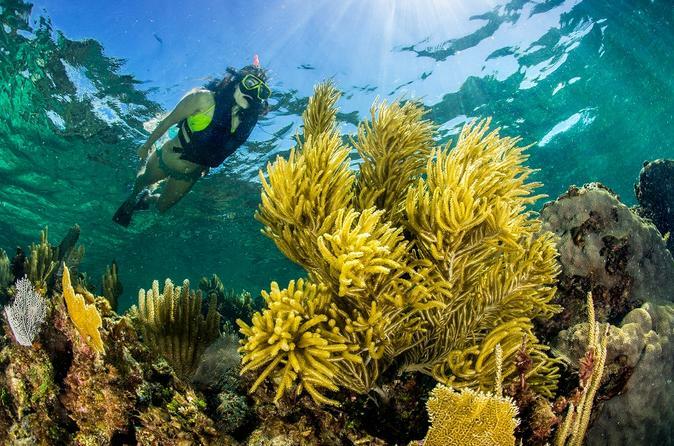 Spend a full day exploring the underwater features of Puerto Morelos Reef National Park (Parque Nacional Arrecife Puerto Morelos). You'll ride a boat to part of the world's second largest reef and snorkel with a guide. A buffet lunch and open bar are available during free time at a Caribbean beach club. This snorkeling day trip departs from the Riviera Maya or Cancun hotels. Departing from hotels in the Riviera Maya or Cancun in the morning, you'll arrive at a beach club facing the Caribbean Sea. After a safety briefing you'll receive snorkeling gear and then hop in a boat for the ride to Puerto Morelos Reef National Park. Snorkel at two different sites on the coral reef for about 1.5 hours. Your guide will provide guidelines for exploring the park and point out the biodiversity of marine life in the area. Returning to the beach club, grab a snack and be ready for a third snorkeling session — it's optional but recommended as the site is at a deep spot where you can appreciate different fauna. Feast on a delicious buffet lunch with traditional dishes and have free time to relax and enjoy the open bar — soft drinks, beer, rum, and tequila. Afterward, board your tour vehicle for return transport to your hotel. Camera entry style “action cam” (Go Pro), provided it is mounted during the tour in a chest or head mount is allowed. the use of video cameras mounted action selfie sticks, mounts wrist, hand or other body part other than chest or head is prohibited.